Additive Manufacturing is about using a single material for creating complex shapes and “impossible” geometries. While designers and scientists are focused on optimizing the 3D printing process in terms of design and manufacturing with a given range of rigid materials (such as 3D printing with plastics, resins or metals), researchers of the MIT and the Singapore University of Technology and Design are looking in another direction. 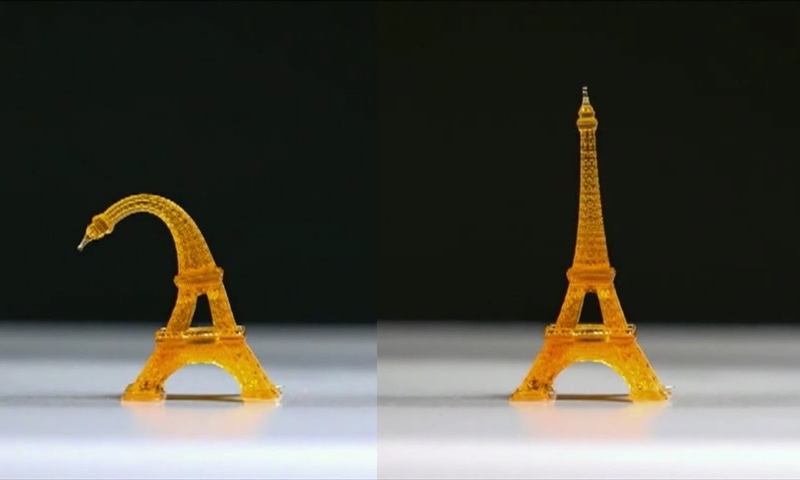 Shape memory polymers have nothing to do with the traditional 3D printing materials. These materials are programmed to change shape over time. That said, along with the constant growth of 3D printing, we foresee the rise of a new technology: 4D printing. Let’s have a look at this new trend in the 3D Printing field and get to know how a shape memory polymer can be a true revolution for the Additive Manufacturing industry. What are shape memory polymers? 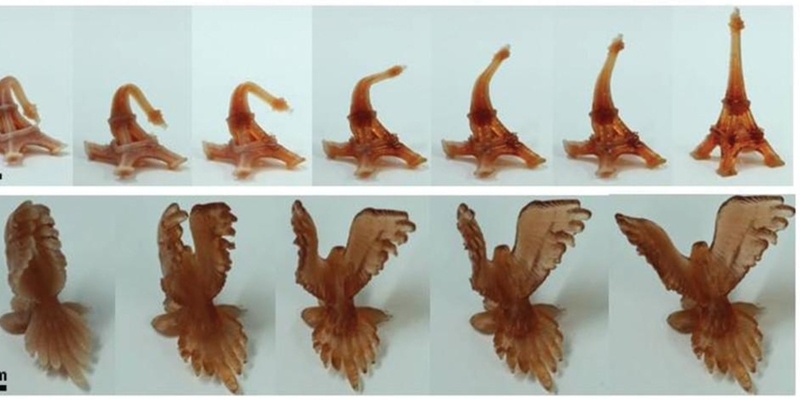 According to the report of the researchers on the topic, a shape memory polymer (SMP) is a kind of material that has the potential of showing large elastic deformation in response to environmental stimuli. In other words, it has the ability to change shape in various ways, and then come back to its original form, when an external energy is applied on it. 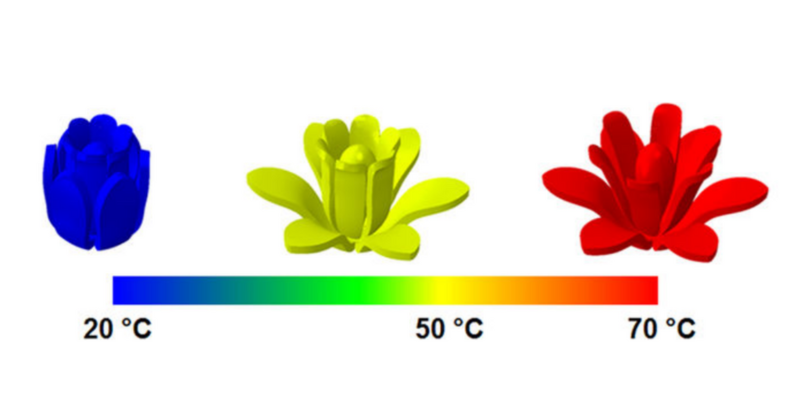 In order to cause this change, this emerging kind of 3D printing material should be exposed to heat, light, electricity, moisture, or an environment with a specific pH. The experiments about shape memory polymers are conducted using a high-resolution projection microstereolithography (PμSL) technique that will be described in the following paragraphs. The shape memory polymers are constructed by combining mono-functional monomers resins as linear chain builder, and multi-functional oligomer resins as crosslinkers. The 3D printer used for processing the two types of resins and convert them into shape memory polymers is a commercial Polyjet 3D printer. You may wonder, since shape memory polymers are 3D printing materials, why do we talk about 4D printing? Which are the differences between these two technologies, and how are they connected? As we explained in the introduction of this blog post, 3D printing is about creating solid and rigid parts, or in other words, objects that do not change shape under the exposure to external energy. On the other hand, as our recent article explains, the 4D printing technology deals with pre-programmed parts of the printed structure that react under their exposure to a stimulus. So basically, 4D printing is about 3D printing changing over time. Differences between 3D printing and 4D printing procedures. You can differentiate the two technologies by the material they use as input. In the case of 3D printing, the material used could be any of the 3D printing materials that exist on the market today. In the case of 4D printing though, a “smart material” is needed to make the printing process work successfully. “Smart materials” are considered to be the hydrogels and shape memory polymers. In one of our previous articles about hydrogels, we explained how they work: They swell when solvent molecules diffuse into polymer network memory polymer. On the other hand, a shape memory polymer is capable of transforming itself into different shapes and shows shape memory behavior that can be controlled and programmed. In other words, a shape memory polymer is the kind of material that is needed to make a successful 4D printing procedure work. How is a shape memory polymer fabricated? The following figure represents the way a multimaterial shape memory polymer is produced based on projection microstereolithography (PμSL). As it will be fabricated with the 3D printing technology, a 3D file is needed. Thus, the 3D model of the object is sliced into horizontal slices, thanks to a 3D modeling software-procedure which applies to all the 3D printing techniques. In the next step, these sliced images are transferred to a digital micro display, that works as a dynamic photo mask. Then, a LED projects UV light to form the patterns corresponding to the sliced images and illuminates onto the surface of photocurable polymer solution. When the material is solidified to form the corresponding layer, the next sliced image is projected on top of the previous one. The procedure is repeated layer by layer until the whole structure is formed. 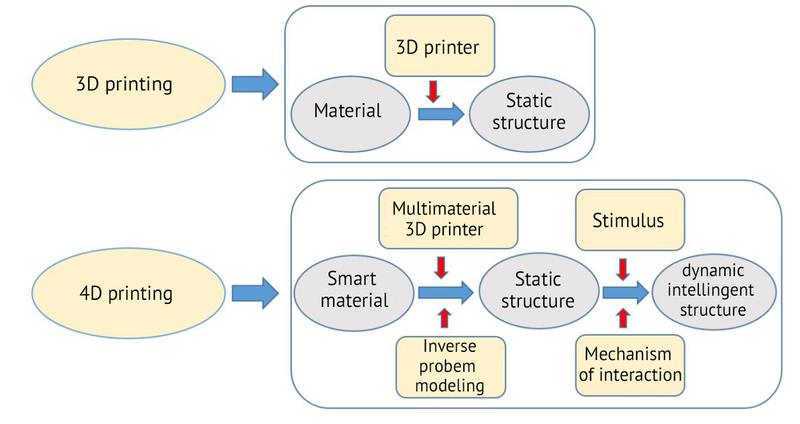 The process of 4D printing is considered as a multi material process. That’s because it enables the resin exchange between monomers and oligomer resins to create the final shape memory polymer. The material containers in the following figure correspond to each type of resin. The shape memory polymers are printed using commercial Polyjet 3D printers, because they can create materials with properties ranging between rigid and elastomeric by mixing the two base resins that polymers are made of. How do shape memory polymers work? Shape memory polymers have the ability to return back to their initial shape in a short period of time after being exposed to certain conditions, such as heat exposure, water exposure etc.. The key attribute that makes the polymers change shape is the thermomechanical properties of the resins they are made of. Thanks to the polymer resin preparations and the way the two kind of resins chemically react during the 3D printing process, the polymers can change shape. Moreover, in order to successfully activate the shape changing result, precisely prescribed shape memory polymer fibers are used during the printing procedure. In the following picture, you can see how a 3D printed shape memory polymer changes form, step by step. It represents a simple structure that has the ability to be used as a gripper: it can grab and release objects. On the right side of the picture we can see different temporary forms that the gripper can take during its transformation. We can also see its initial and final position, which corresponds to its initially printed form and its form after being heated. In the following picture we see the shape memory polymer in snapshots during the procedure of grabbing a screw. Even if the commercial use of shape changing materials is very limited until now in the 3D printing industry, it has a big potential for future use. The most limiting factor is that of the commercially used manufacturing techniques. Up to now, shape memory polymers have been approached only in experimentational level. This means that it remains unknown how the printed parts perform in the long term. We do not know their level of efficiency after been submitted to many transformations and until which point they are fully functional. In addition, it is challenging to produce materials that exhibit desired thermomechanical behavior in large scale and in any kind of design complexity. It will take some time for the scientists to experiment with printing active materials, and to make this procedure available for commercial use. Which are the possible applications of shape memory polymers? Many fields will be impacted positively by the use of shape memory polymers. The biggest impact is expected to be noticed in the health industry. Additive Manufacturing is already widely used in the medical sector. Every kind of 3D printing materials is used for various purposes, from 3D printed bones to bioprinting with innovative materials. Considering that there is a constant arising need for new 3D printing materials and technologies in the medical sector, it is believed that the use of shape memory polymers will have a great impact on the people who are in need of medicine and technology. A possible application would be the creation of devices made out of shape memory polymers. These, could possibly be drug devices that will be inserted inside the body and will be scheduled to work upon the heat changes that the body demonstrates. For example, they will release medicine or antibiotics when they notice fever or some other kind of body temperature changes. Another field where shape memory polymers could find precious applications would be the energy industry. A possible use of shape memory materials would be on solar panels that would be working as sensors for detecting the sun and auto-rotating towards the right direction. By combining Material Science and Robotics, it will be possible to build smart shape changing solar panels that will automatically adjust their inclination for the maximum energy efficiency. One thing is certain: either being integrated into the field of electronics, in health care or in the energy sector, shape memory polymers are expected to be pretty disruptive for the engineering field. Nowadays, it is a huge trend to experiment with different and innovative 3D printing materials, fact that leads us to the conclusion that the rise of 4D printing is just around the corner. Yet, scientists have a long way to go before getting this new technology industrialized. Until then, you can enjoy all the benefits that the 3D printing technology offers and start with the creation of your own project. All you have to do is to upload your file here!